Soaking in the largest hot springs pool in the world (it's 405' by 100') and gazing up at pine-covered mountain peaks, you'll understand why the Ute Indians and the wealthy miners and European aristocrats treasured Glenwood Springs. In 1882, the town grew catering to the rich from around the world. Doc Holliday, the gunslinger known for his involvement in the OK Corral shootout, died and lies in the Linwood Cemetery. The Hotel Colorado opened in the early 1890s known for being a luxurious summer destination catering to the rich and famous. Teddy Roosevelt stayed here for a summer during his term as President; three U.S. presidents have been known to vacation here. Today, people come for the history and hot springs as much as the rugged and beautiful surroundings. 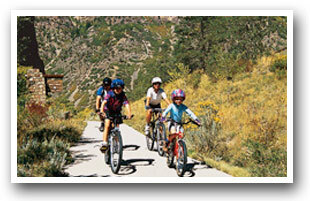 Glenwood Canyon offers recreational fun for all families. There is a 16-mile paved bike path that connects four rest areas: Bair Ranch, Hanging Lake, Grizzly Creek, and No Name. At each of these rest areas you will find a parking lot, restrooms, a picnic area, trash containers, and access to hiking trails. 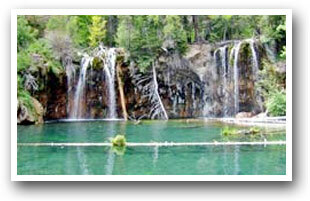 One of the best hiking trail in the area is Hanging Lake National Natural Landmark. It was designated as one in 2011 for it's outstanding geological resources; it represents a spectacular example of a lake formed by travertine deposition and comprises a rare wetland ecosystem including waterfalls and hanging gardens. This area is also popular with spelunkers (cave explorers) because of the number of caves and one of the largest underground rivers in the country. The vapor caves is a unique attraction because spring water flows through the floors at 125 degrees creating underground geothermal steam baths. Many people come here to ward off colds and other minor illnesses like the Utes did back in the day. Winter enthusiasts will love this area for the cross-country skiing and downhill skiing. 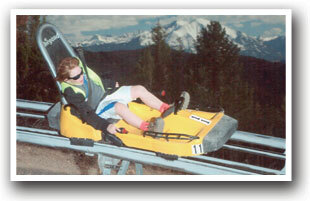 Sunlight Mountain Resort is only 30 minutes away and offers 67 trails covering over 600 acres of land. Sunlight is home to one of the steepest and one of the longest trails in Colorado. 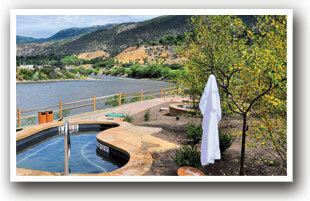 Glenwood Springs is located at the intersection of The Colorado River and Roaring Fork River. Raft on world-class whitewaters and enjoy breathtaking scenery if you can look away from the excitement! The river offers rough rapids as well as laid-back floats down-river. The Glenwood Springs Whitewater Activity Area, known as the first man-made whitewater feature built on the entire length of The Colorado River, is located immediately upstream from the Midland Ave Bridge. The park hosts annual events such as Throw Down Show Down. The White River National Forest as well as four wilderness areas are open for various other activities. Camping, fishing, rock climbing, horseback riding, ATV/Jeeping, zipline, golfing, hunting, snowmobiling, and much more! 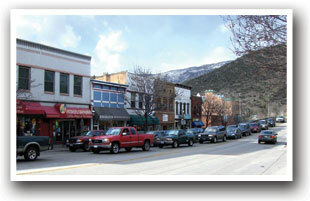 Glenwood Springs is 117-miles from the Colorado-Utah border and 157 miles west of Denver along Interstate-70. Commercial air travel accommodations are handled by the Glenwood Springs Airport and the Garfield County Regional Airport. Please contact your preferred travel agent or airline for flight arrangements. 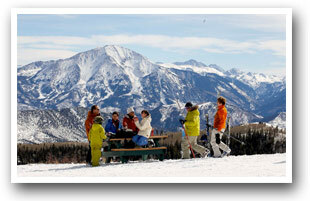 Glenwood Springs is 181-miles west of Denver International Airport (DIA).